There is plenty of legislation and regulation out there about environmental and sustainability matters - enough that the term "Green Tape" has evolved to describe the deluge and its impacts on business. However there are also opportunities out there for the regulatory savvy, such as grants for carbon reduction. Listed below are some general resources and fact sheets on regulatory matters. 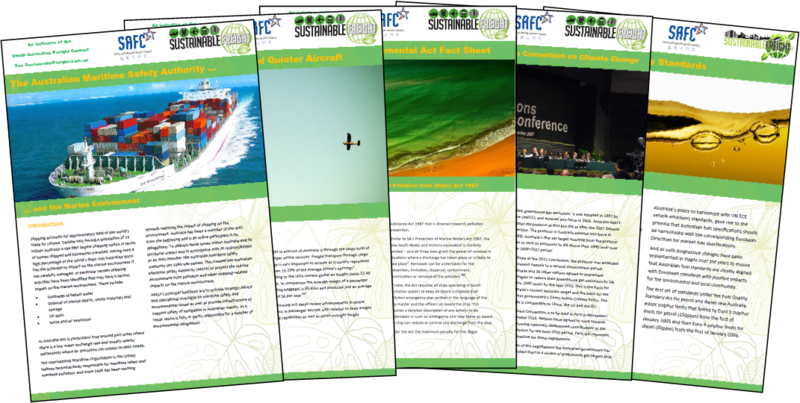 covering environmental policy, regulations and international bodies can be accessed by clicking here. How the Commonwealth's Emissions Reduction Fund operates with regards to transport, and opportunities for transport-based businesses. The primary Commonwealth Environmental legislation. The Strategy represents an integrated national approach to planning for the freight demand which is expected to double by 2030. It addresses the issues impacting on freight efficiencies, including freight infrastructure, planning, investment and regulation. The Australian National Ports Strategy provides a coordinated planning approach to assist Australian governments in planning for port infrastructure and the associated road and rail linkages that connect these important gateways to all Australian cities and towns. The primary role of the Aviation and Airports Division is to advise the Government on the policy and regulatory framework for the Australian aviation and airports industry. South Australia is committed to reducing our total greenhouse gas emissions by 60 per cent (to 40 per cent of 1990 levels) by 2050. To help achieve this, the state government has developed a Low Emission Vehicle Strategy to increase the proportion of these vehicles on the state's roads. The State Government in consultation with planning and transport industries and interest groups developed the draft Integrated Transport and Land Use Plan. Following its release almost 1500 submissions were received and more than 2500 people attended community engagement events. This Plan guides individuals, community organisations, governments and businesses to secure the wellbeing of all South Australians. South Australia's Strategic Plan contains our community’s visions and goals; its 100 measurable targets reflect our priorities. The Plan identifies priorities for South Australia. The Resource Efficiency Assistance Program (REAP) supports South Australian companies to measure their energy, water and waste usage. It is set up to tailor specific programs for each company to help them develop long term resource efficiency mechanisms. Available tools include business diagnostics, benchmarking, strategic planning and staff training. REAP is part of Zero Waste SA which subsidises waste audits and development of resource management plans to a maximum of $25,000. This program is part of the Adelaide Solar City project and is designed to assist small-medium and large companies, as well as business tenants and organisations, to cut power consumption, increase profitability and reduce the production of greenhouse gases. It includes an energy audit and assistance to develop and implement an action plan. This program is part of the Adelaide Solar City project and is designed to assist small-medium and large companies, as well as business tenants and organisations, to cut power consumption, increase profitability and reduce the production of greenhouse gases. The Clean Energy Finance Corporation (CEFC) welcomes proposals from organisations seeking finance for investment-ready renewable energy technology, low emissions technology and energy efficiency projects. Commercial Building Disclosure (CBD) is a national program designed to improve the energy efficiency of Australia’s large office buildings. The program is managed by the Department of Industry, with Australian state/territory governments and the New Zealand Government, and is mandatory for retailers and importers of regulated equipment and appliances. NGER is the national mechanism for businesses to report greenhouse gas emissions, energy production, energy consumption and other information specified under NGER legislation. The $3.2 billion Australian Renewable Energy Agency (ARENA) is an independent Commonwealth authority, supporting innovations that improve the competitiveness of renewable energy technologies and increase the supply of renewable energy in Australia.